Our children’s health is of great importance and one area essential to their wellbeing is dental health. Without proper dental care, high levels of bacteria in the mouth can cause infections, tooth decay and gum disease. Regular dentist checkups can do more than give a shiny white smile, they can indicate to dentists a lot about a child’s overall health. When their mouth is healthy, it is likely that their overall health is good too. In September it was time for our children in Colombia to be visited by a team of three dentists. Unlike many of us in the UK who dread a visit to the dentist, the children were very excited and were eager to say ‘ahh’. The dentists ran sessions to teach to the children how to brush their teeth and about good dental hygiene practices. The children listened attentively and the day was not only informative but also fun and practical. The dentists examined each child’s teeth and gave a report of the children who needed additional treatment so that Stand by Me can ensure they receive the correct treatment. Regular dental visits are essential for the maintenance of healthy teeth and gums of the children in our care. In between these dental examinations, it is important that our children know how to keep their teeth and gums clean and healthy. The visiting dentists brought dental care kits for each child which caused much excitement among our children. 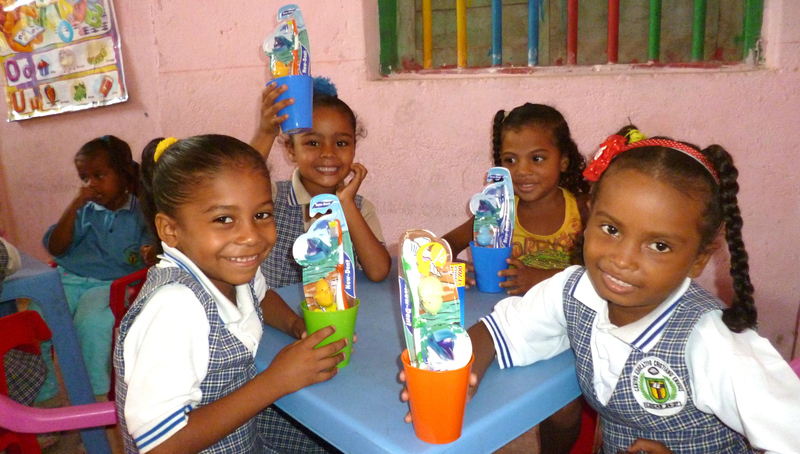 They were so happy to receive the kits containing a toothbrush, toothpaste, floss and mouthwash. Our children’s health needs are of first importance to us yet sadly so many of our children in Colombia suffer with medical problems, visit our Colombia Medical Fund Priority Project to see how we plan to meet their needs.